Last month I had the pleasure of meeting Ellen Jaffe Jones here in Orlando. She is becoming a rising celebrity in the Vegan movement. 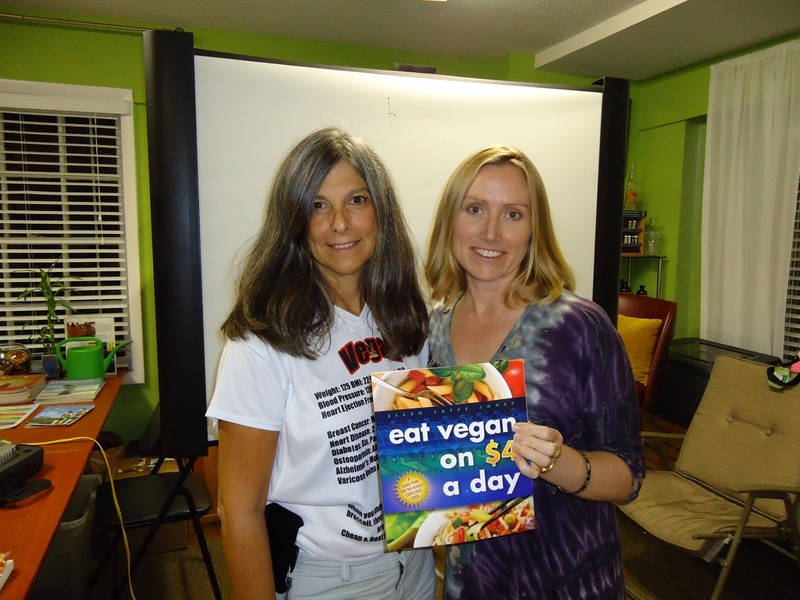 We had a low turnout here in Orlando but in the veggie city of Vancouver she spoke in front of 300 people and she has had several radio and TV interviews, so I am happy that her book has been getting the attention it deserves. I have made several recipes from the book and so far so good. The directions are all very clear and simple to follow, so whoever did the editing did a great job. The recipes are mostly low fat and low sodium and she breaks down the cost per serving for each meal based on buying things like beans and brown rice in bulk. I'm not sure if the fruits and veggies she quoted prices for were all Organic, but if you buy through a CSA or a Food Buying Co-op, you are probably doing okay. My favorites from the book have been the Easy Miso Dressing, Creamy Tahini Dressing, Beans and Greens Stir Fry, and the Taste of Thai Saute. You can get your copy of Vegan on $4 a day on Amazon.com. You can eat Vegan Anywhere!